Senator McCain blasts Obama over Syria. "I thought Jimmy Carter was bad, but he pales in comparison to this president." Senator John McCain (R., Ariz.) blasted President Barack Obama and his policy towards Syria on Tuesday, the Washington Free Beacon reports. 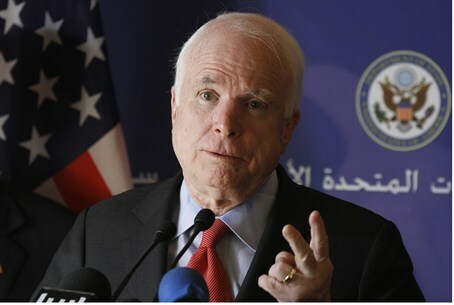 McCain also warned that the rapidly deteriorating situation in Syria could pose a terror threat to the United States. “It has turned into a tragedy of mammoth proportions, and if you don’t care about Syria, it’s becoming a regional conflict. It’s spread to Lebanon, it’s spread to Turkey, it’s spread to Jordan. It is spreading throughout the region and sooner or later, it will affect the United States of America,” he said. McCain said Obama’s inaction in Syria and lack of support for moderate rebels could lead to an Al-Qaeda takeover of the country. McCain did not spare Secretary of State John Kerry from heavy criticism either, denouncing Kerry for negotiating with Russia while that country continues to prop up the Assad regime in Syria. “I’m telling you, this guy [Assad] is a monster. The people who are giving him the weapons are the Russians, and our Secretary of State is buddy buddy and palsy-walsy with … his buddy Sergey [Lavrov] in places like Geneva and others,” he said. McCain has long been a vocal opponent of Obama's policy on Syria and has several times called on the president to take action in the civil war in Syria. His latest criticism of the administration comes after he described Kerry as “a human wrecking ball” in the Middle East back in November. “When the President of the United States says he’s going to launch a strike on another country, i.e. Syria, and the Secretary of State says, ‘Don’t worry, it’ll be unbelievably small’ - that is staggering, that’s mind-boggling,” McCain charged at the time.